As athletes, we know you work hard to achieve your goals. Each goal passed, each victory achieved requires hours of dedication. Dedication to that 5:00 AM alarm (and maybe one snooze), dedication to that next lap, perfecting that perfect pass. The last thing you want to smell when you suit up in your jersey or lace up your favorite pair of shoes is the odor that has come from the hours of sweat and determination. Sweat that has seeped into the polyester, DRI fit, and jersey material; now a breeding ground for odor-causing bacteria. 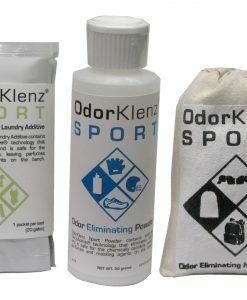 At OdorKlenz, we know that the smells emanating from your “fresh and clean,” or supposedly clean, but not fresh, sports equipment is the last thing you want to spend money on, and time on, re-washing and re-washing until the stench is bearable. You need to save your money for more sports apparel, or the new cleats, not more laundry products full of empty promises and over fragranced detergents that try to sell you on smelling like a tropical beach. That’s why we have created an entire line of odor-cleansing products that have been formulated just for athletes. 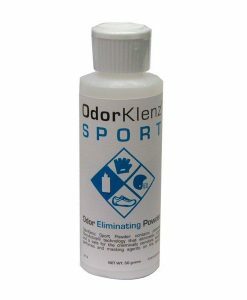 The OdorKlenz sports line has been put through the most rigorous test, and comes with a 30-day money back guarantee; the ultimate guarantee in the cleaning industry. The Season Sample Bag is perfect for all your needs. The Season Sample bag is full of products that athletes have selected as a product that they have loved to use. Choose from a range of colors to coordinate with your team. The products for sports season (which can be year-round!) have been tried and tested under the most intense trials: the rival game. The Sports Laundry Additive is your first defense against odors. Sports apparel is notorious for retaining pungent sweat-inducing bacteria. The fibers that are most commonly found in sports jerseys, DRI fit, and polyester yoga pants (yes, even when you wear yoga pants, but may not actually “yoga” in them. They still collect the stink. 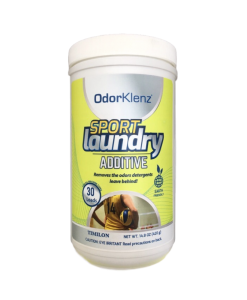 The sports laundry additive is formulated with the revolutionary OdorKlenz technology to remove and neutralize odors from their source. The laundry additive is gentle enough for all sporting fabric. 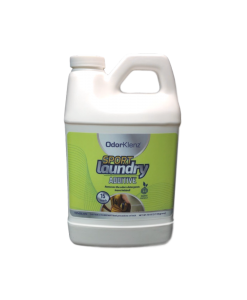 The laundry additive does not contain harsh chemicals, bleach, or overpowering fragrances. 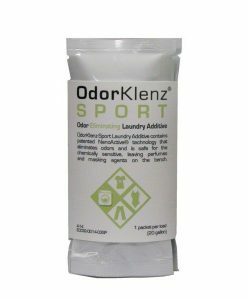 The innovative OdorKlenz Sports Release Bag is perfect for removing odors from equipment that cannot be washed in a traditional washing machine. The Sports Release Bag is versatile in its usage. The Sports Release Bag can be used to remove odors from spaces where bacteria and sweat build up but is not a surface that can be easily cleaned. Sprinkle the powder over your equipment. It’s safe to use on helmets, even for those most sensitive to cleaning products. To use an air-purifier in lockers, or in the trunk of your car that you haul your sports equipment in, just place the Sports Release Bag in your trunk, locker, backpack, or preferred equipment-hauling device. 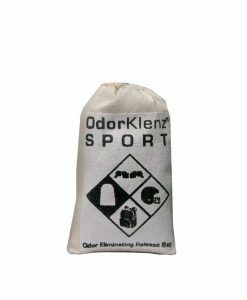 The Sports Release Bag will swiftly and efficiently remove and neutralize odors.